Peter Wylde and Candor 15. Wellington, FL – March 20, 2015 – It was déjà vu during the second annual Hunter Derby Days at The Ridge at Wellington Turf Tour. Peter Wylde has racked up an impressive list of accolades – including winning Olympic gold – but last year he attempted his first USHJA International Hunter derby, and won with Smoking Gun. Today, Wylde returned to the turf at The Ridge Farm to ride Candor 15 to first place finish in the $15,000 USHJA International Hunter Derby, clinching the championship title for his second consecutive year. Prior to posing with the coveted rosette, Wylde and Candor 15 had to best an extremely competitive field of 28 horse and rider combinations over two rounds of competition. Following the first, classic hunter round of competition, the top 12 horse and rider combinations returned in reverse order of their rankings for the second round of competition over the Rob Carey (CAN) designed course. Wylde and Candor 15 made the biggest jump from the first round to the second round. Originally tied for the fourth place with Kelley Farmer and one of her multiple mounts, So to Speak. They earned 180 points from the judges for the first round, but came back to dominate in the handy. Using Candor’s scope and handiness, Wylde smoked the competition to earn 7 handy points from Panel A and 6 handy points from Panel B. Combined with four points added to the base scores of 95 and 91 for taking all high options, Wylde and Candor ended the day with the highest handy score of 207. Candor 15 is a little different from other competitors. The grey gelding is a veteran of the Adult Jumper division, but in the fall of 2014, owner Dana Tourville asked if Wylde believed that Candor could do the hunters. Without hesitation, Wylde suggested taking a shot with the brave horse, winning two classes during their first show in the hunter ring at Saugerties and then kicking off the season with good ribbons in the High Performance Hunters and the sixth place finish for their efforts during the first of the 2015 $15,000 USHJA International Hunter Derby of The Ridge at Wellington Turf Tour. It was his scope and handiness that allowed Wylde to leave no stone unturned on the derby field. The handy course did not blatantly offer options for the riders. Carey designed the track so that the rider had to decide how tight they wanted to make the turns. For Wylde, it was the perfect handy course. Candor was able to land from a fence, make a tight turn and jump up to the big vertical that incurred several rubs, and knocked the first round’s third place horse and rider combination, Farmer and Joyful, out of their spot with a rail falling to the floor. Farmer rode six entries in the $15,000 USHJA International Hunter Derby, with five of her mounts finishing in the top 12. Farmer ended the day with the second place overall aboard Symbolic, a new mount for the professional hunter rider. The Ridge Derby Days were his first hunter debut, adding a notch to his belt and already making a name only two weeks into competition with Farmer. They ended the competition with a score of 384 points, only three points behind Wylde and Candor 15. Hannah Isop and Red Ryder, owned by Tracy Freels, rode to the third place finish with the overall score of 383.5, while Farmer picked up the fourth and fifth place finishes with Mindful and So To Speak, respectively. 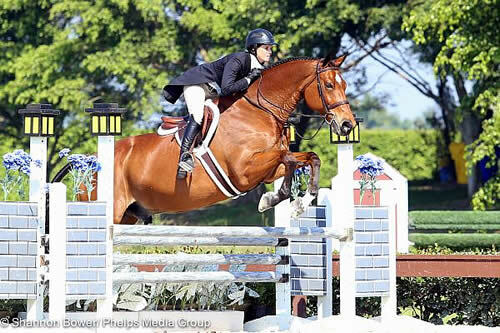 Rounding out the top six was Jennifer Bauersachs and For Love, owned by Spring Hill Farm, Inc.
Wylde now has his sights set on the derby at the final week of the Winter Equestrian Festival, as well as the Kentucky and Devon derby classes. He hopes to qualify for the 2015 USHJA International Hunter Derby Championship in Lexington, KY this summer. When you saw top hunter riders names such as Winn Alden, Evan Coluccio, and Hannah Isop, you knew that the competition for the National Derby today at The Ridge at Wellington was going to be anything but easy. Almost 30 of the top National derby horses took their turn at the track designed by Carey, completing two rounds in the sand arena surrounded by beautiful palm trees on the picturesque farm. At the conclusion of the competition, Winn Alden would ride Southern Arches, LLC’s Marshall to the top prize. In the first round, Taylor St. Jacques was the third rider in the ring, riding Alejandro. Starting the day off with a bang, she posted an impressive score, taking all the high options to wind up with a score of 178. This score would hold up throughout the morning, finishing at the top of the first round scores. Unfortunately, an overenthusiastic Alejandro played a bit too hard landing off of one of the oxers in the handy round, resulting in the elimination of the top placed team. Alden also took all of the high options in the first round to finish within striking distance of the lead with a score of 174. Penny Lombardo rode Too Much Fun over all the high options to come back just one point behind at 173. The handy round saw competition heat up as the pairs returned to compete in reverse order. Every pair took all four high options, adding eight to their base scores. Alden left little to chance, laying down another impressive trip to add 181 to her original score, totaling out at 355. Marshall floated around the ring, as the epitome of a top class hunter at the top of his game. Alden came to The Ridge today with the intention of making it a low-key day of competition. Emma Kurtz and Eloquence moved up, coming back fourth from the first round. The pair rode a very handy second round, finishing with a 178 to end at 350 to bring home the red ribbon. Tiffany Morrissey and Bellucci added an additional 177 to their original 169 to total at 346, good enough for third. Denice De Risio-Perry rode the gorgeous dappled bay gelding Crescendo to a fourth place finish. Revelstoke and Hannah Isop finished in fifth overall. Penny Lombardo would round out the top six on Missy Yoder’s Too Much Fun. The eleventh week of The Ridge at Wellington’s Turf Tour will continue tomorrow, Saturday, March 21, at the International Polo Club Palm Beach (IPC) with its 1.40m Grand Prix. Saturday’s events promise to be exciting, with the $15,000 1.40m Grand Prix running from 8 a.m. through 4:30 p.m. on the turf field. The second ring will begin at 8 a.m., with the Children/Adult Jumper classes, offering a classic round for the division, running with an open card until noon. In addition, there will be a Low Schooling Jumper division with two classes running alongside one another, offered at this height. The $2,000 Child and Adult Classic is pointed from Marshall & Sterling, NAL & WIHS. The Junior/Amateur-Owners will start at 12:30 p.m. and run until 4:30 p.m., with both the regular class and classic card open concurrently. The $3,000 Junior/Amateur-Owner Jumper Classic is NAL pointed. Medium schooling jumpers will also be offered with cards running concurrently. The event is approaching quickly, so riders should get their entries in to avoid post-entry fees. Week ten of the Ridge at Wellington’s Turf Tour will take place at The International Polo Club, located at 3667 120th Avenue South in Wellington, FL 33414. The show entrance will be off 120th Street between Lake Worth Road and Pierson Road. Previous PostTop Show Jumpers Duel on Day One of Live Oak International Jumping CompetitionNext PostThe Classic Company Is Jumpin’ in Atlanta!